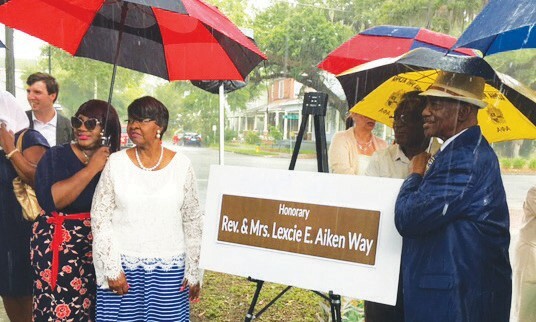 Last Friday, June 8, 2018, the City of Savannah unveiled its first honorary street designation, in honor of Savannah residents Reverend Lexice Aiken and his wife Mary Aiken, the pastor and first lady of St. Luke Missionary Baptist Church for more than 50 years. Nearly 100 City Council members, Rev. and Mrs. Aiken, the Aiken family, members of the St. Luke Missionary Baptist Church, and City staff gathered under cloudy skies to celebrate this historical designation. For the next five years a one-block stretch of West 38th Street between MLK, Jr. Boulevard and Montgomery Street will be honorably designated as “Rev. and Mrs. Lexice E. Aiken Way”. The petition for the honorary street designation was unanimously approved by the MPC’s Historic Sites and Monument Commission and has been reviewed by all impacted City agencies. The petition also met all the requirements set out in the City’s Naming Ordinance.